Survey reveals over a third of 18-26s do not drink: Is the drinking culture changing? Craft distiller Durham Distillery has launched a limited release Durham Cask Aged Gin, with just over 1,000 bottles produced, signed by head distiller Jess Tomlinson. Durham Cask Aged Gin embraces the art of cask ageing, most commonly used in whisky distillation, creating a richness of colour not commonly associated with gin. 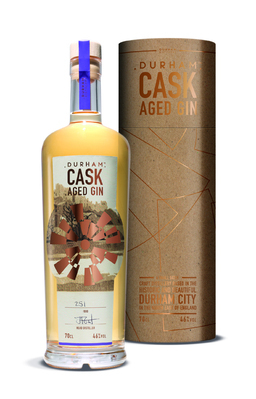 The cask ageing process has also added a fourth level of flavor to Durham Gin’s unique combination of botanicals. Jess Thomlinson, head distiller, explains: “I wanted to experiment with the cask aged process and produce a unique gin offering. We used two complimentary types of aged oak casks, American Bourbon and Spanish Oloroso Sherry, to create ours – adding fruity and honeyed complexity with subtle vanilla and citrus zest top notes. The small-batch craft distillery, based in the outskirts of Durham, has been distilling since 2013 and is one of the UK’s most traditional distilleries, using only the highest quality ingredients and a 400 litre copper pot called Lily (after the owner’s daughter). Limited edition, Durham Cask Aged Gin, has been created using two complimentary types of aged oak casks, American Bourbon and Spanish Oloroso Sherry. Available in 70cl bottles from £40, 46% ABV.